If we go to early 2.000, during the years before the housing bubble burst in 2007, in Spain were being built in the vicinity of the 700,000 homes year, with a large speculative component, driven by low interest rates and ever-rising property prices, what homeownership turned into a very interesting investment option. As of August 2007, there was a slowdown in demand has meant that much of the housing stock built and not sold, has become a major burden on the balance sheet of banks and savings banks, main financing actors of the projects. From a investor point of view, there are three benefits this situation bring in. 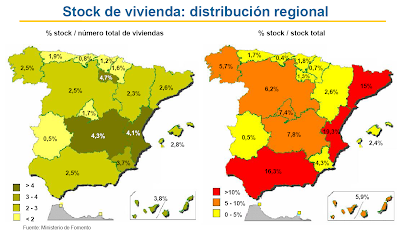 First, according to the Ministry of Fomento in its report of January 2012 stated an excess of 676,038 new homes in our country available for sale, where Andalusia, Valencia and Catalonia represent over 50% of the total. Second, as a result of the decline in demand there has been an unprecedented price repositioning in our country. From the peak in the first quarter of 2008 prices level has fallen over 23%, in real terms, as reported by the Ministry of Fomento. (See chart). By region, this price repositioning is greater where the excess of supply is higher, which has forced the various players to make economic efforts aimed to boost that demand. (See chart). Finally very willingness of banks and saving banks to set up very favorable financing conditions, both interest rate levels, in some cases Euribor plus 0.50%, and the amount of funding that can vary over a cradle of 60% to even 100% of the total value of the home. All these elements jointly with the pressing need to output the housing stock in the hands of financial institutions, has produced a great willingness from the government, financial institutions, developers, etc., to facilitate mechanisms to speed up the purchase process by private individuals and investment groups. Apart of all this items, the recent announcement made by the government of Spain, who is considering to recognize the residence to those non EU citizens who buy a home worth more than € 160,000, make the decision to purchase a home in Spain an unprecedented investment opportunity, especially for Russian and Chinese people where the market is focusing mainly due to the high level of wealth and income . Main residence: There is a demand for professional needs in main cities Madrid y Barcelona, where there is currently a lack of Real Estate offer, both for rental and sale. Second Home: The high quality construction of our stock, their situation in coastal areas, near golf courses or ski resort, makes this moment a great opportunity to purchase your second home in Europe. Investment: Price levels, financing terms, rental facilities in coastal areas with high demand for European vacation, along with expectations of price recovery after the end of the crisis, put a new very attractive element to take in account. Diversification of the investment portfolio from the groups with high income levels and strong economic capacity.